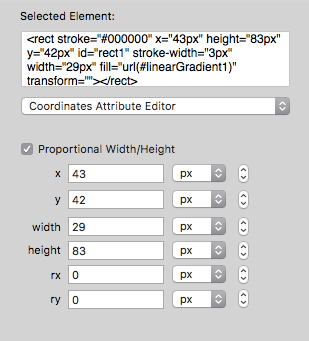 The Coordinates Attribute Editor is available for setting attributes like “x”, “y”, “width” and “height”. The attributes shown in the Coordinates Attribute Editor are context-sensitive. The panel shown above is for editing a <rect> element. For a <circle> element, a different set of attributes will be displayed for editing: “cx”, “cy”, and “r”. For rectangular elements like <rect> and <image>, when the “Proportional Width/Height” checkbox is checked, a change to the “width” or “height” attributes will adjust both value to preserve the element’s current aspect ratio. A pop-up menu for each attribute is available to set the unit of measurement. The available units are “em”, “ex”, “px”, “pt”, “pc”, “cm”, “mm”, “in”, and “%”. Each attribute also has a stepper control for making incremental adjustments to the values with a mouse click.